http://www.warshak.com/ for educational materials like a video you can share with your children called Welcome Back Pluto and you can educate yourself with a book about preventing badmouthing of the other parent called Divorce Poison. Dr. Richard Warshak is also an expert witness. http://www.jmichaelbone.com/ for educating yourself and your attorney and counselor on how to present alienation to the courts. Dr. J. Michael Bone is also an expert witness. Jennifer McBride’s book is a primer on parental alienation. 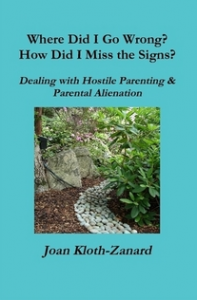 http://www.childcentereddivorce.com/kids/ for a book that doesn’t just tell you how to say to the kids you are getting a divorce but tells it for you. This book will help you tell your kids about your divorce without making the kids pay the price for your divorce. This book also has guides and is a workbook.